The Moo Duk Kwan® martial art school founded by Hwang Kee had its humble beginnings in Seoul Korea in 1945. Since those early days, his martial art system and his Moo Do philosophy have grown in popularity to a worldwide phenomenon today. This website is dedicated to connecting visitors with the authoritative history of Founder Hwang Kee's Moo Duk Kwan® martial art school from its inception to its present day popularity. 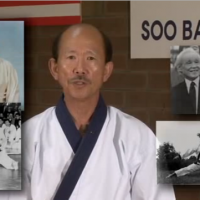 For insight into the Soo Bahk Do® martial art system that is taught in all Moo Duk Kwan® schools yo u may enjoy visiting the Soo Bahk Do® Institute. We trust you will find your visit educational and enjoyable.